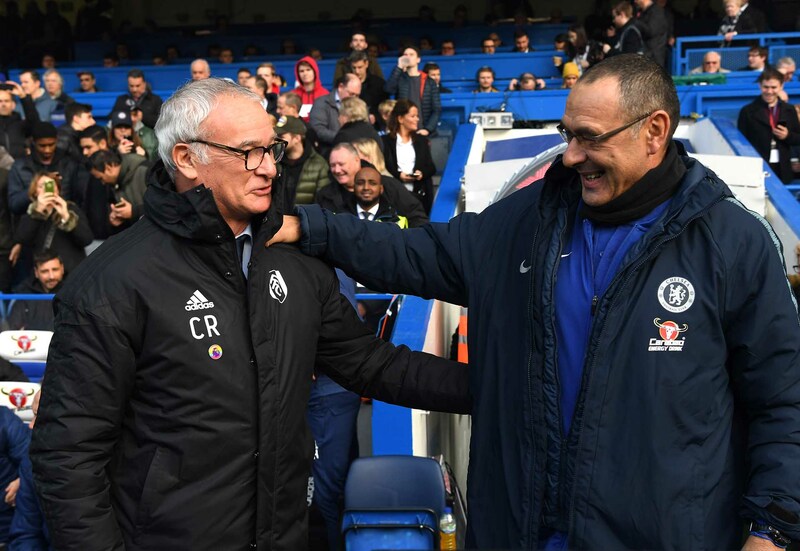 Maurizio Sarri, Manager and Claudio Ranieri, Manager of Fulham embrace prior to the Premier League match between Chelsea FC and Fulham FC at Stamford Bridge on December 1, 2018 in London. Chelsea return to Premier League action at lunchtime on Sunday, beginning their arduous task of three Premier League fixtures in six days. The start of the journey on Sunday takes place at Stamford Bridge where the Blues will host their neighbors Fulham. Sunday’s match will take on a little bit of a nostalgic feeling. Not only is Claudio Ranieri taking charge of his second match as manager of Fulham, but Andre Schurrle will be making his return to Stamford Bridge, this time clad in the colours of the Cottagers. Fulham will enter this match with a little bit of confidence restored. Their win over Southampton last week was just their second win of their campaign. And while Fulham still conceded two goals against the Saints, they also started scoring again as well, with Schurrle netting one and Aleksandar Mitrovic grabbing a brace. While the arrival of Ranieri is certainly going to help Fulham’s defensive organisation, at the same time, it may also help their attack. Due to injuries and other reasons, Slavisa Jokanovic had been playing Ryan Sessegnon as a left back for the majority of the season, rather than deploying him in a more attacking role as he did last season in Championship, and it seemed to blunt Fulham’s attack and limit Sessegnon’s influence on the match. Ranieri restored Sessegnon to the left week against Southampton, and he provided a good threat for Fulham on their left side. For Chelsea, last Saturday’s defeat to Tottenham was the lowest point of the season thus far. A 3-0 defeat at Wembley left media and supporters questioning Sarri’s tactics, his team selection, and whether or not he needs to be more adaptable. But it was Chelsea’s first defeat of the season and a manager cannot legislate for at least 7 of the 11 players he sent out to play all having terrible games. But the best tonic for a poor defeat is another match in quick succession, and PAOK were perfect opponents on Thursday night. A 4-0 win saw Olivier Giroud bag two goals and Alvaro Morata grab one at the end. It also provided a nice feel-good moment when Callum Hudson-Odoi scored his first goal for Chelsea. But Fulham will provide a much more dangerous threat going forward, a stouter defence, and won’t likely be playing over 80 minutes with 10 men. Ranieri’s team often play a compact brand of football and look to counter attack, so the onus will be on Chelsea to break down Fulham’s defence while containing Fulham’s pace on the break. It’s a good challenge to have, given that Wolverhampton Wanderers play a similar style and will force Chelsea to work on their organisation, especially since Jorginho is going to continue to play in the centre of a midfield three, despite calls for N’Golo Kante to return there. Sunday’s match should give Chelsea an opponent to continue to rebuild confidence, and building confidence will be important leading up to next Saturday’s match against Manchester City.